MANILA, Philippines - President Duterte will visit Cambodia, Hong Kong and China this week to promote the Philippines’ economic interests and to discuss his policies before fellow leaders, investors and Filipino migrant workers. He will attend the World Economic Forum (WEF) in Phnom Penh, Cambodia from May 10 to 11 where he will highlight the achievements of the Association of Southeast Asian Nations (ASEAN) as well as the challenges it faces before world leaders and business executives. Aside from Duterte, Vietnamese Prime Minister Nguyen Xuan Phuc, Lao Prime Minister Thongloun and China-led Asian Infrastructure Investment Bank (AIIB) president Jin Liqun will be among the 620 participants in the forum, which concludes on May 12. Duterte will have a separate meeting with CEOs. Duterte will fly to Hong Kong to meet with the Filipino community also on May 11. He will cap the trip by joining the Belt and Road Forum for International Cooperation in China from May 14 to 15. 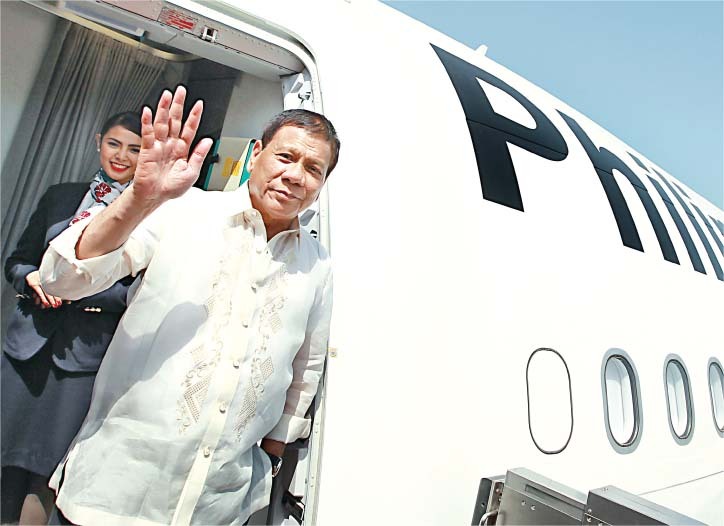 Duterte is scheduled to leave the country for the six-day foreign trip tomorrow. Foreign Affairs spokesman Robespierre Bolivar said that as this year’s ASEAN chair, the President is expected to share his views and insights regarding developments in the region – including concerns that need to be addressed. “The organizers of the World Economic Forum have given the President a press conference, if I’m not mistaken, to address the business leaders, the CEOs who are present to promote DuterteNomics and the President’s socio-economic agenda,” Bolivar said in a press briefing yesterday in Malacañang. Duterte, who will be joining the WEF as chairman of the ASEAN, is also expected to share his views on the region’s achievements and challenges. He is also scheduled to deliver a message to the youth of ASEAN. Also expected to be raised by Duterte at the forum is the establishment of the ASEAN science and technology partnership for which the Philippines and Thailand had each pledged $1 million.